The other day as I was cleaning my studio I decided to take a little inventory of the quilts that were sitting in a big pile in the corner of my room. Little did I know, how many antique quilts (bought at various antique malls or garage sales) I had actually collected over the last few years. Nine is the magic number right now, you can see a pile of several of them in the photo above...sitting on what else a piece of antique furniture, a 1920's crank phonograph to be more specific. My plan is to take proper photos of the quilts sometime this fall, and share them here on the blog as well. I even have plans to recreate one of the quilts using some Denyse Schmidt Flea Market Fancy that I had picked up some time ago, purchased specifically with this in mind. 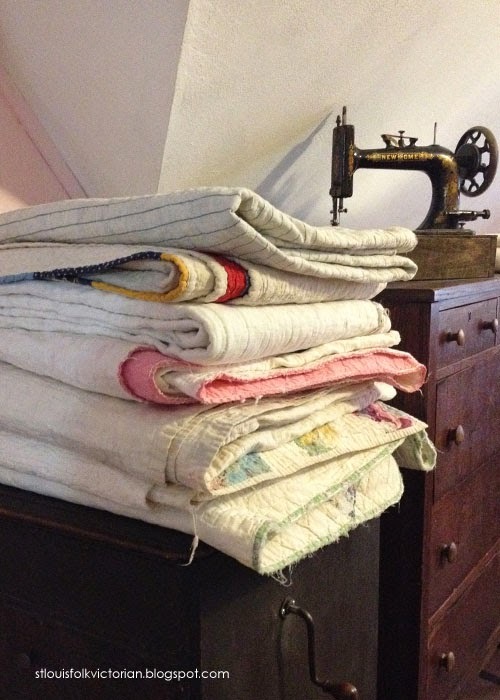 Do you have any antique quilts around your home? Do you actually use them, or do they hang out in piles like mine? Here in New Zealand there isn't much of a quilting tradition - I am always jealous when I see the way that North Americans seem to be able to pick up quilts at yard sales (called garage sales here) and fairs. I would love to see photos of your collection. I do have quite a pile of antique quilts. I even took pictures with the plan to share about them on the blog. I think they're the best!